Meaningful Health Solutions - Save $50! T100 Desktop Air Purifier 2-Pack. Save $50! 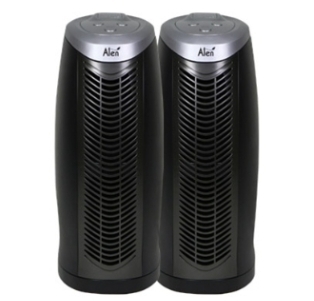 T100 Desktop Air Purifier 2-Pack. Save $50.00 with a 2-Pack. The Alen T100 air purifier (2-Pack) combines our signature HEPA air filter, an activated carbon filter with an ozone-safe ionizer and is ideal for small spaces. Our signature HEPA filter, in the T100 air purifier eliminates airborne pollen, pet dander, mold spores, dust and dust mites, while the active layer of carbon neutralizes odor. We also offer a more specialized filter that contains our patented odor eliminating powder that will virtually eliminate some of the more potent odors that can accumulate in small spaces (available separately). The T100 air purifier tested to capture 84% of airborne contaminants, including smoke, pollen, dust, pet dander, dust mites and molds; in spaces up to 125 sq. ft.